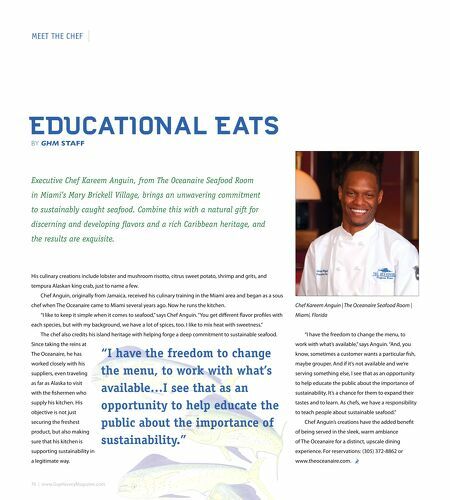 MEET THE CHEF EDUCATIONAL EATS BY GHM STAFF Executive Chef Kareem Anguin, from The Oceanaire Seafood Room in Miami's Mary Brickell Village, brings an unwavering commitment to sustainably caught seafood. Combine this with a natural gift for discerning and developing favors and a rich Caribbean heritage, and the results are exquisite. His culinary creations include lobster and mushroom risotto, citrus sweet potato, shrimp and grits, and tempura Alaskan king crab, just to name a few. Chef Anguin, originally from Jamaica, received his culinary training in the Miami area and began as a sous chef when The Oceanaire came to Miami several years ago. Now he runs the kitchen. "I like to keep it simple when it comes to seafood," says Chef Anguin. 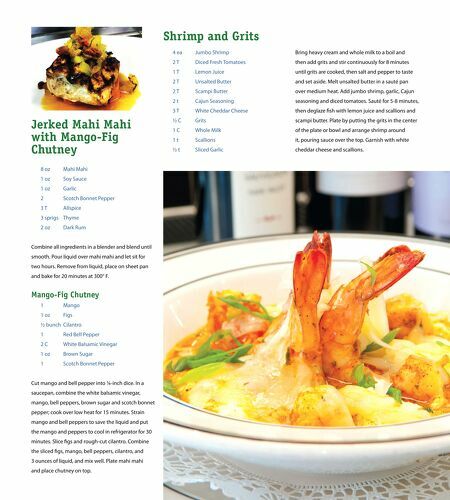 "You get diferent favor profles with Chef Kareem Anguin | The Oceanaire Seafood Room | Miami, Florida each species, but with my background, we have a lot of spices, too. I like to mix heat with sweetness." The chef also credits his island heritage with helping forge a deep commitment to sustainable seafood. Since taking the reins at The Oceanaire, he has worked closely with his suppliers, even traveling as far as Alaska to visit with the fshermen who supply his kitchen. His objective is not just securing the freshest product, but also making sure that his kitchen is "I have the freedom to change the menu, to work with what's available," says Anguin. "And, you "I have the freedom to change the menu, to work with what's available…I see that as an opportunity to help educate the public about the importance of sustainability." know, sometimes a customer wants a particular fsh, maybe grouper. And if it's not available and we're serving something else, I see that as an opportunity to help educate the public about the importance of sustainability. It's a chance for them to expand their tastes and to learn. As chefs, we have a responsibility to teach people about sustainable seafood." Chef Anguin's creations have the added beneft of being served in the sleek, warm ambiance of The Oceanaire for a distinct, upscale dining supporting sustainability in experience. For reservations: (305) 372-8862 or a legitimate way. www.theoceanaire.com.